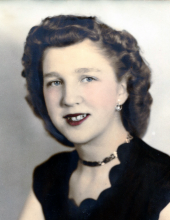 Ruth L. Groover, 86, of Brush, CO passed away Jan. 25, 2019. A private family service will be held at a later date, with inurnment at Riverside Cemetery. Ruth was born March 17, 1932 in Fairmont, MN to Fredrick William and Lucy Ann (Engle) Tonne. She attended school in Fairmont, and later moved to Colorado in 1952. She was married to Merlin Fitch from 1950 until his passing in 1972. She was then married to Bud Groover from 1974 until his passing in 1996. She is survived by her son-in-law Kenneth Buchanan of Sterling, who was her care taker and guardian for the last 16 years; grandson Michael M. Buchanan of Sterling; and sister-in-law Mavis Tonne of Fairmont, MN. Ruth was preceded in death by her daughter Dianna Buchanan, parents, 3 brothers and 2 sisters. To send flowers or a remembrance gift to the family of Ruth Lorraine Groover, please visit our Tribute Store. "Email Address" would like to share the life celebration of Ruth Lorraine Groover. Click on the "link" to go to share a favorite memory or leave a condolence message for the family.